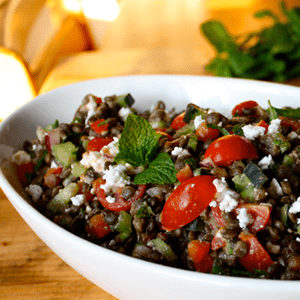 This lentil salad is a winner in so many ways. It takes a little bit of effort to chop all of those fresh veggies and herbs, but once you’re done, you’ve got enough food for a week’s worth of meals. Eat it in winter, spring, summer, or fall. It’s a good vegetarian source of protein and fiber and has only 221 calories per serving. Combine lemon juice, oil, and thyme in a small bowl; whisk to blend. 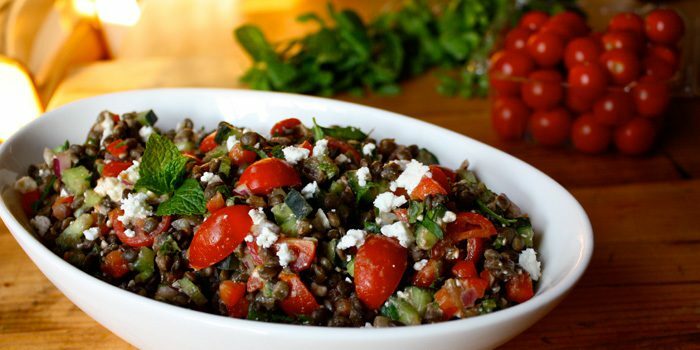 Combine lentils, cheese, cucumber, celery, tomatoes, bell pepper, onion, parsley, and mint in a large bowl; mix well. Drizzle with dressing; toss gently to blend. Refrigerate, covered, for 1 to 12 hours. You can eat it after an hour, but the next day is the best!